Several international guests joined with more than 200 delegates from all around Australia and New Zealand at the Fire Manager's Research Workshop at Wollongong in July. The event followed last year's successful workshop in Beechworth, Victoria, and included an even mix of end-users and researchers. 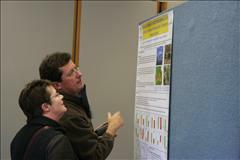 The end-users presented alongside the researchers in a program that covered the full spectrum of Bushfire CRC research. A highlight of the workshop was the display of the research posters - 65 in total - that were put together by the researchers and students. All these posters are now online. The comments from respondents will be taken on board in the future planning over research workshops.